When I started writing freelance pieces for magazines I started with topics that were familiar to me. Local festivals, my dog, and outdoor recreation soon became profitable parts of my life. 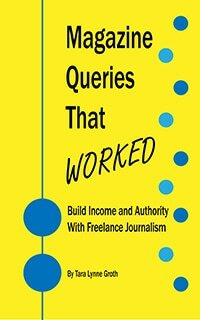 When I read the query from today’s guest post contributor, I loved that she used something that came into her life by surprise as fodder for her freelance pieces. Who would think that a few items purchased at a yard sale could turn into multiple streams of freelance income? It happens, and it happened to Trisha Faye, our guest contributor! With my loot tucked safely in my backseat, I drove home like a demon. A laundry basket contained three old quilt tops and a set of old quilt blocks I’d discovered at a yard sale. Once home, I inspected my bounty. The thirty quilt blocks were made by different people and had their names stitched on them. One had a date: 1934. One of the antique quilt squares Trisha found at a yard sale. These squares and I were destined for an unexpected journey. After many hours of research, I found their Athelstan, Iowa origins and a few years later met several descendants of the women that made these squares. By writing about them, I’d earn far more than the $15 or $20 I’d paid for them. One day I saw a site that paid for short children’s stories. They only paid $15, but as a new writer looking for publication, getting any payment was exciting. The theme for the next submittal was ‘sewing’. I thought for days about how to take my sewing knowledge and use it in a children’s story. And then I had it…the quilt squares! I used tidbits of historical facts that I’d learned over the years and turned them into a fictional children’s story. Guardian Angel Kids accepted the story. As a bonus, I received another $3 for the photograph they used. The first of multiple features for QUILTER’S WORLD. Eventually, many queries later, my story ideas were accepted by Quilter’s World for two additional features, one in 2013 and one in 2015 – for quite a bit more than $15! With this growth in my career, I learned many things as a writer. Confidence: A huge benefit I gained through this was confidence. I had three more acceptances to add to my resume. Also, I found that the boost to my self-confidence from depositing one large check was worth far more than the monetary value of the check. Lead times: Working with a national publication requires a much longer lead time. The short story market only needed two months. With the national magazine, it was one year from query to publication. As writers we need to look ahead and plan for assignments needing more time. For example, I submitted an article to Purpose magazine on July 31st. They accepted it, but it won’t print–and I won’t get paid for it–until April 2016. Factor these extended payments into your budget. Photograph Requirements: The small online children’s publisher was happy with a jpeg image. The magazines needed high-definition photographs. It wasn’t difficult. All I had to do was do a ‘save as’ and save the image as a TIFF file, but it was something new I had to learn about. Unexpected Time: I discovered that taking, saving, and transmitting photographs can be a time intensive portion of the project. I needed eleven photographs for the first feature. A friend helped me and between the two of us we spent more time on the photographs than I spent writing the entire article. It was something to be aware of and factor into future projects. Transmitting Photographs: Transmitting high definition photographs through my Yahoo mailbox was excruciating. The file sizes were so large that I could only send one at a time, and it took almost a half an hour for each one to transmit. With the second piece, they wouldn’t send at all. The editor suggested Dropbox, the free file transfer app, so that was another lesson to learn. It worked. I got the photographs to the editor in time, and I learned something. Writing is a unique journey. We learn and grow as authors every day, improving our craft. When we can take something from our personal life, a passion independent of our writing, and tweak it to merge with our wordsmithing career…and get a little cash in the process…it becomes an amazing trip. Trisha Faye lives in north Texas where much of her writing is about people, places, and things from the past. These 1934 quilt squares will appear again in her upcoming book, Iron on Tuesday, a follow-up to Wash on Monday. When she’s not writing, she’s often in the garden, or playing with the many rescued kittens that have taken over her home. Find her on Facebook and Twitter @TexasTrishaFaye. Check out her blog.